Why on earth would I want to relaunch a running website? There are a ton of reasons for a website relaunch. After the initial version of my website was up and running, the excitement became less and less. The old contact form hadn’t been protected properly which led to a flood of spam mails. Adobe discontinued the product the old website had been created with. The old layout wasn’t responsive, means it was not really usable on mobile phones and tablets. Finally it wasn’t GDPR compliant and who wants to risk running a website that doesn’t comply with the legal requirements? All that together was reason that I didn’t update anything for almost two years. But do I need an up to date website? My personal opinion is yes, I do! When you Google my name, you will find all sorts of hits. Facebook, Instagram, Twitter and Youtube next to Flickr and 500px. But my website will always be first on the list. I know, it’s hard to Imagine but there are people who live without social media these days. Many of us have no idea how these people survive but let me assure you, they live amongst us! Anyway, how do I want to reach these people when they can’t connect to my social media channels? Correct, they will search for what they are looking for on my website. If they can’t find what they are searching for or can’t easily connect, they may carry on to somewhere else and potentially I have lost them forever. How to create the new Online presence? I mentioned before that the software I was using to create the old website is discontinued. Let’s just pick another tool, right? Nope, it isn’t that easy unfortunately. When you are checking the market, there are many different options. Each product may have its strengths and its weaknesses and there is all sort of cost involved. Choosing the right package can be a real pain in the backside. After days of studying and comparing many options, I ended up deciding to create my new online presence using WordPress. A big role in making this decision played my friend Oliver Bauer from www.fotosatzstudio.de. As an experienced webdesigner he trusts the product and as my friend he could assist in case I would get stuck. And guess what – I had to consult him when I really got stuck! When is the time to realise it? What a strange question you may ask. 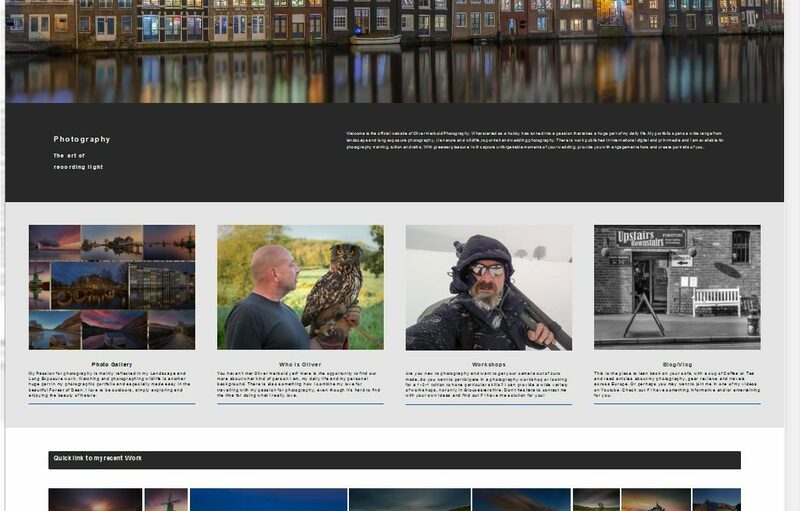 Just install a website builder, have a few images ready and with a few mouse clicks, the layout is online. Sure, that’s the theory but does it really work like this? Apparently not for me – and I am convinced I’m not alone with that issue. There is always something else that keeps you away from what you have planned and what you really want to do. I think it’s called ‘life’! However, I began thinking of a relaunch at the beginning of the year. The decision to use WordPress was made in February and I had it installed. After a bit of playing around, I wouldn’t call that phase serious working, the project had to be packed on ice. Then it took me until end of August, beginning of September that I really started working on it. Now it is mid October and the site is running. That shows such a project can be done in a relatively short time span, but really guys… sometimes we need somebody to kick our asses to get it going. After good few weeks of creating layouts, modifying and finally delete them to create new ones, the new design is online. I hope you agree that I have managed to create a modern looking and clearly structured design. The responsive layout works well on all devices I have tested it. The contact form should provide an easy way to contact me. The galleries are looking as I wanted them to be, in a proper justified image grid and allow me to add new photos with just a few mouse clicks. Well and there is the blog of course – you are reading one of its posts right now. I will try to keep you up to date with blog posts on a more or less regular basis.